Soil Compaction is a big problem in our Urban Landscapes. This compaction happens in a variety of ways that include: construction traffic, vehicle traffic, high volume of foot traffic, and water flow. When soils are moist, compaction occurs more readily due to the lubricating effects of water and the flow of fine clay particles between the coarser sand particles. Soil at field capacity holds its maximum amount of water. This is the condition that exists following heavy rain or irrigation and during which soils are most susceptible to compaction. When compaction occurs, the solid material near the soil surface (commonly the surface four to eight inches is most affected) is compressed into a more dense mass. This results in possible damage to existing plant roots and fewer and smaller pores in the compacted soil layer. Finer textured soils are commonly affected more than sands Compaction commonly results in water moving into and through the soil more slowly. Surface runoff and erosion are increased. 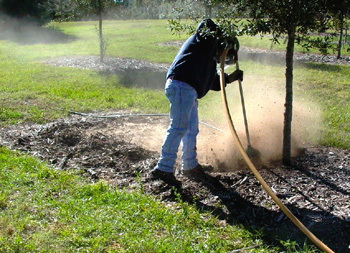 Less water moves into the soil to become available for absorption by tree roots, and soil aeration may be reduced. Plant roots also often have more difficulty growing in and through compacted soil since they grow through pore spaces in the soil. It is easier to avoid compaction with thoughtful design and construction of the landscape than to correct it after it occurs. The emphasis is on prevention. While it may not be practical to eliminate compaction from a construction site, a number of things can and should be done to minimize its impact on trees. During construction put up tree safe fencing. Cover area with 6-10 inches of mulch if heavy equipment must go over root area. Perform final grading by hand or use low impact small machinery. Consult with a Boutte Certified Arborist before a project gets underway. Compacted soils are typically prone to drought. Macropores hold air or, after heavy rain or irrigation, they fill with water. When compaction reduces these voids, less oxygen is available, carbon dioxide does not readily move away from the roots and water-holding capacity is reduced. Soils often have lower nutrient and organic matter levels. Organic matter also provides a long-term source of nutrients. The most effective treatment for compaction is a process where the soil is tilled with an air tool while adding soil amendments, beneficial bacteria/fungi, and organic granular fertilization. This potting soil-type environment helps new roots develop. Traditionally this has been done with spades, augers, trenchers and backhoes, balancing the increased pore space against root damage caused by these mechanical methods. Since the air tool does not damage roots, you can now double the treated area without overstressing the tree. Because this treatment affects 100 percent of the soil volume, there is a high probability of success. Even without other treatments, applying a mulch layer can be beneficial to trees on compacted sites. This is the least costly treatment available because of the low cost of composted yard waste and wood chips. Simply apply the mulch in a layer 2 to 4 inches thick from near the trunk and extend it out as far as possible, preferably to the drip line. Never put mulch directly against the trunk. In the short term, this treatment conserves soil moisture. Annually reapply mulch as necessary to ensure an adequate thickness. In the long term, the mulch will protect against additional compaction and provide organic matter to aid in soil-structure development. Even though you can use mulch over a large surface area, do not expect rapid results. Proper soil-moisture levels are critical for root growth. Because the moisture level is difficult to determine in compacted soils, the use of a moisture-sensing device and an irrigation system is important in overcoming the effects of compaction on established, high-value trees.